"Motai Iburi-Dofu" was created more than 700 years ago in the Kamakura period in the Motai district when the area was thriving with travelers and flourished as a stopping point. A quantity of highly-nourishing soy beans are used, and it lasts many days because it is smoked for a long time. It takes up less luggage space, and therefore was treasured as a reserve for hard journeys over the mountains. 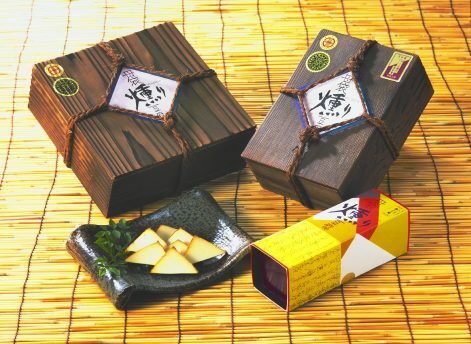 Made with natural brine, Iburi-Dofu is tofu smoked over cherry blossom wood chips. It contains less water, and features a subtle taste like smoked cheese. It is coated with miso, which gives it a rich taste. It can be enjoyed as it is as a nibble with alcoholic drinks, or with soy sauce, wasabi or even mayonnaise. ＜Messages from the Staff＞ Try our "Iburi-Dofu" and enjoy tofu far above the ordinary, accomplished through our handiwork. Tofu is smoked to perfection through the employees' long years of experience and intuition. The one and only smoked tofu in the country is born here. It is seasoned with a base of local groundwater and Gujo miso. The tofu is smoked in the roasted aroma that comes from the smoker chips' being pure cherry blossom wood.